Another fabulous photo by Bruce. I had no idea that he took it because I was so engrossed in my work yesterday (Sunday) morning. And don’t worry, the cling on my Mac isn’t hurting it, just keeps it from getting stolen at airports. Hopefully it doesn’t surprise you that I’m actually a professional writer. I’ve been writing advertising and marketing copy since 1991 which everyone knows is a long, long time ago. Yesterday, I had to do a little “homework” before Bruce and I went to a seminar on “Planning for Your Pets”. Without getting into the details, just know that you should plan ahead for someone to take your pets if you (and your legal spouse) croak. If not, they’re following you to the pearly gates if you live in Texas. And you should get disaster kit together for your four-leggeds. And know how to do first aid on them. We’re remedying all of the above with 1 ) paperwork, 2) a kit, 3) a class. The class is Sunday. I still have to put the paperwork together. I’m giving myself this week as a deadline. I really liked Bruce’s photo though. I didn’t even notice that he was taking it. 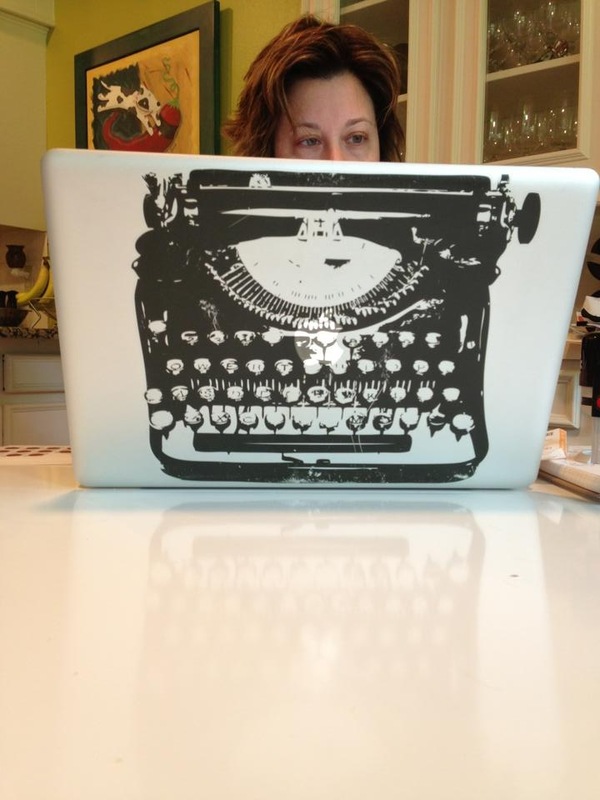 That’s typical for me when I’m writing. I’m definitely in the zone. As a manager I’ve been less in the zone than I’d like but in the last little while, it’s been my home. Works for me. Tonight the lines between work, home and other have been very blurry. I’ve been trying to understand why something so dear to me in college is being compromised. Ah California. Your obscene “view” property values makes civic/charitable organizations with amazing property amazingly greedy. A conference call. And another tale for another day. On to happier topics: Last night we had some neighbors visit. And in Texas, walking the dog often includes a plastic cup filled with the alcoholic beverage of your choice (wine in this case). Bella the chocolate lab needed a long, long walk. And the Gs were prepared to play. As you all know the mosquitos love me so I minimize my time at dusk/night outside. 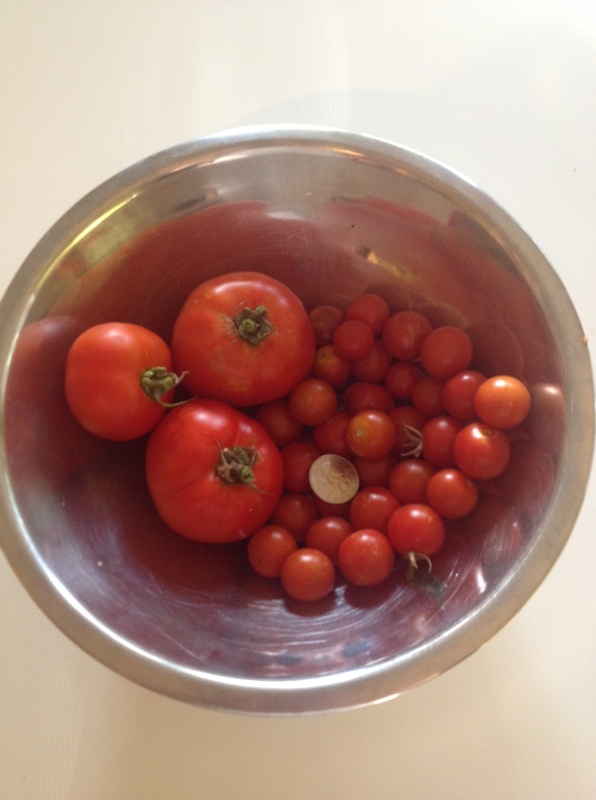 Our sweet neighbor Emily (5) decided to harvest a few things from the urban farm: tomatoes especially. Her lucky parents were not paying attention at all, but were probably surprised by the brown paper bag of fresh veg that she and I gathered! Tomatoes and carrots mostly, with a bit of lettuce for her parents. notice the quarter. those are Texas sized Sweet 100s. The tomatoes are making me happy though I’m a bit worried we won’t eat them fast enough. Oh well, time to make sauce, right? The Sweet 100s are doing great. The rest, not so sure. It’s pretty but truly nothing special. 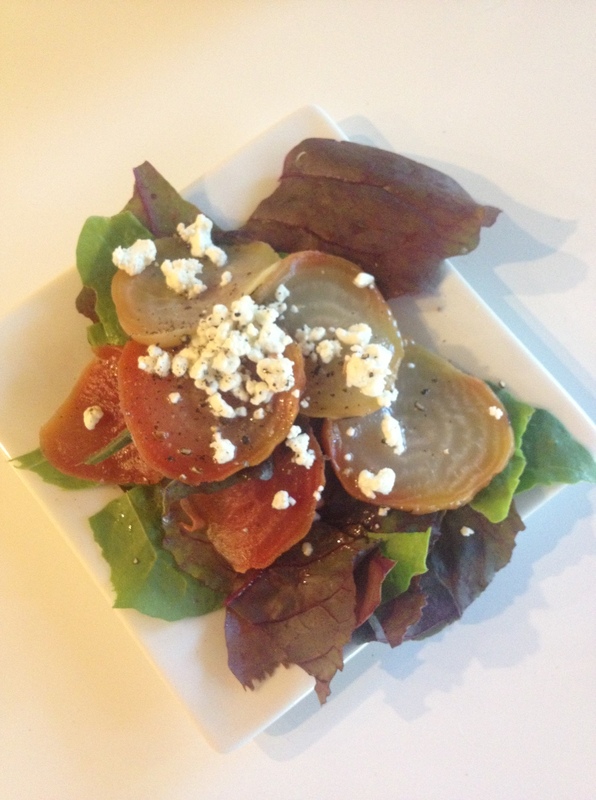 Beet greens, roasted beets, goat cheese, olive oil, salt/pepper. Yummy, yet common. Cheap and cheerful! Hope you all had an enjoyable Monday! This entry was posted in Sow/So and tagged 3G Network, beets, bruce, garden, gardening, harvest, Julie Petroski, Mortroski Midcentury Urban Farm, north Texas, weather. Bookmark the permalink. Had it again tonight, this time with buffalo mozarella that we got to enjoy the tomatoes with. It was good but goat cheese is better. Oh yeah, beets and goat cheese. Nothing better.